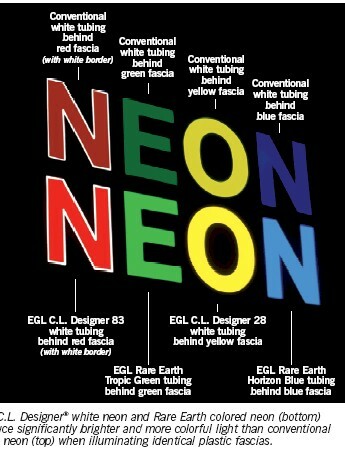 Up to 300% brighter than conventional neon, plus greater output stability and stain resistance. The newest generation of neon tubing from EGL is an outcome of recent advances in television screen technology that utilize rare earth phosphors to achieve the brilliant quality you enjoy today. Research revealed that rare earth chemicals incorporated in phosphor coatings emit extremely narrow bandwidths of light (significant because the narrower the bandwidth, the brighter, more vivid the light emission -- the wider the bandwidth, the dimmer and more washed-out). Rare earth phosphors were also found to maintain their purity and high output levels far longer than conventional phosphors, offering superior performance on all counts. 25 to 300 percent higher output significantly boosts the brilliance and visibility of all rigid and vinyl plastic channel letter fascia colors -- including blues and greens that were previously difficult to illuminate. Higher output can also allow the number of tubing runs to be reduced, cutting material and labor costs significantly. Superior color purity and accuracy enable channel letters to match corporate color schemes with unmatched precision and consistency. Enhanced color stability and resistance to staining and output depreciation keep channel letters looking brighter and more colorful significantly longer than letters containing conventional neon tubing. Super-bright C.L. Designer tubing boosts the vividness and intensity or colored plastic fascias far beyond that of white tubing. 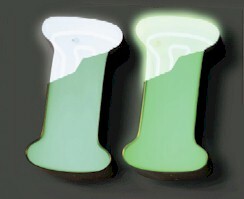 Blending or three rare-earth phosphors to produce each brilliant shade of white creates a range of cool-to-warm variants, allowing fine tuning of the illuminated plastic fascia colors to match corporate color schemes precisely. While the outstanding properties of CL Designer tubing make it particularly suitable for channel letter applications, it is equally desirable for open neon signage and architectural lighting requiring super-bright whites, brilliant colors, and long term color accuracy. It processes as easily as conventional phosphor-coated tubing and is in available in 7, 8, 9, 10, 12, 13, 15, and 18mm diameters. Using colored C.L. Designer tubing behind colored fascias produces signage that is not only brighter but much more vivid and pure than signage illuminated with conventional white tubing. 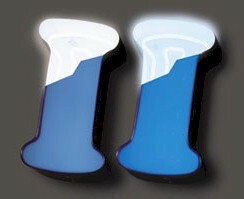 Compare identical blue plastic fascia colors illuminated by conventional white tubing (left) and EGL's horizon blue (right).